Waynesboro, VA — Fishburne Military School officially announced its monthly Cadet Awards winners for October 2018 yesterday. Cadet award winners are selected by a board of Cadet Officers, and approved by the Commandant of Cadets. A Cadet award winner is selected based upon his academic, military and community achievements throughout the previous month. In recognition of his outstanding academic and military performance, Cadet Justin Tomayer, son of Ms. Jennifer Kulchawick, has been named Fishburne Military School’s Cadet of the Month. Tomayer, a junior from Chesterton, IN, is in his first year at Fishburne Military School and is a Squad Leader in Charlie Company. The announcement, which reads in part: “Through outstanding performance of duty, Cadet Justin Tomayer is hereby awarded Cadet of the Month … Your exemplary performance and dedication to duty is a testament to your deserving such and honor”, was made during a formation before the entire assembled Corps of Cadets. In recognition of his outstanding academic and military performance, Cadet Donald Cravins III, son of Mr. and Mrs. Donald Cravins, Jr., was named Fishburne Military School’s Cadet Officer of the Month for October 2018. Cravins, a senior from Washington, DC is in his fourth year at Fishburne Military School and serves as the Battalion Executive Officer. 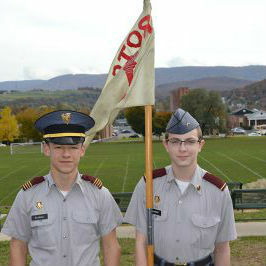 Charlie Company Commander, Cadet Dylan Gladhill (New Market, MD) and guidon bearer, Cadet Joseph Caddies (Virginia Beach, VA). In recognition of his outstanding academic and military performance, Cadet Myles Hurlbut, son of Mr. and Mrs. Shane Hurlbut, was named Fishburne Military School’s Cadet Non-Commissioned Officer of the Month for October 2018. Hurlbut, a Junior from Thousand Oaks, CA, is in his third year at Fishburne Military School. In recognition of their teamwork, professionalism and overall bearing, Charlie Company, Commanded by Cadet Dylan Gladhill, has been designated as Company of the Month for October 2018 at Fishburne Military School. Gladhill, son of Mr. and Mrs. James Gladhill, is a third-generation Caissons who hails from New Market, MD. Fishburne Military School is the oldest and smallest of all military schools for boys in Virginia. Its college-prep curriculum is built on the structure of an Army JROTC program. FMS has been designated as a JROTC Honor Unit with Distinction and may nominate qualified candidates to the United States Service Academies. Fishburne hosts one of only four Summer JROTC programs in the nation that is accredited by US Army Cadet Command.